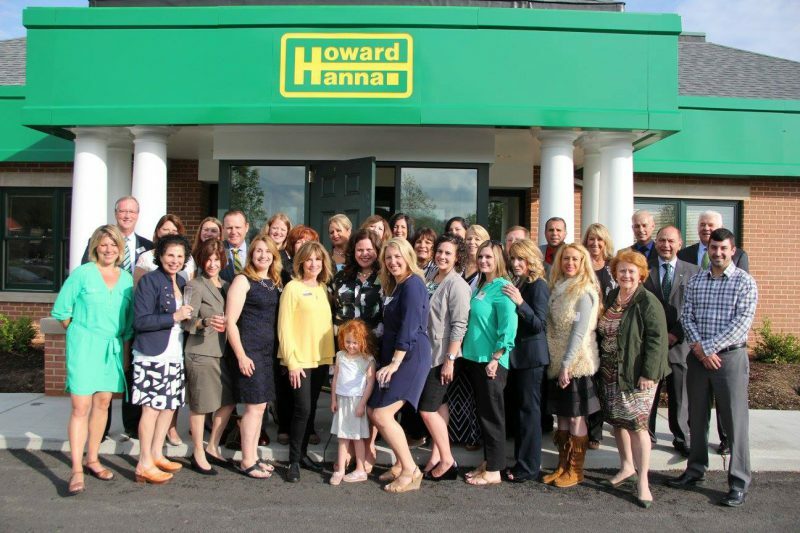 Seven Fields, PA – On Thursday, May 12, 2016, Howard Hanna Real Estate Services held a Grand Re-Opening of its Adams Township/Seven Fields office located at 100 Highpoint Drive off Route 228. Expanded and redesigned to accommodate 45 sales associates, the office is led by Sales Director Kelly Hanna Riley. The office is also serviced by Howard Hanna Mortgage loan originator Russ Ford and Howard Hanna Insurance agent Patty Fischer. Expanded from approximately 2,000 square feet to more than 4,500 square feet, the Hanna office was also redesigned to accommodate the modern real agent with charging stations for mobile devices, desk spaces with plug-in and charging capabilities for laptop computers, high tech wall screens, and comfortable collaboration space for meetings or social gatherings. Conference/closing rooms feature wall screens for presentations or for Skype video conferencing. Howard Hanna has been instrumental in Seven Fields since its origin in 1988 when the first roads were cut and was responsible for the development growth of the entire community as it exists today. “Howard Hanna is proud and excited to continue to be involved as a driving force of development and real estate success in Seven Fields Borough and Adams Township,” said Tom Ceponis, Senior Vice President and North Regional Manager of Howard Hanna. The re-opening event was christened with Vice President and Sales Director Kelly Hanna Riley’s words of thanks to all who planned and implemented the office changes and to all who attended to celebrate, followed with a champagne toast by company President Helen Hanna Casey. Howard W. Hanna, Jr., founder of the Howard Hanna Company in 1957, Howard W. “Hoddy” Hanna, III, Chairman, and Annie Hanna Cestra, Executive Vice President and Chief Operating Officer were also on hand, meeting and talking to an array of home buyers and sellers. Additionally, officials from Seven Fields Borough and Adams Township, along with the Adams Township Volunteer Fire Department and Chief of Police, architect Steve Casey, construction manager Patrick Riley, and general contractor PW Campbell attended. The Adams/Seven Fields office is currently home to 35 sales associates whose written sales volume through April 30, 2016 is up 27% over last year, while closed volume is up 23%. Howard Hanna maintains the #1 market share in Adams Township with 34.4% of listings sold and in Seven Fields with 46.2% year to date. For all of your real estate needs, contact the Howard Hanna Adams Township/Seven Fields office at 724-772-8822 or email Sales Director Kelly Hanna Riley at KRiley@howardhanna.com. Howard Hanna Real Estate Services is the #1 real estate company serving Pennsylvania and Ohio and the 4th largest real estate company in the United States. The family-owned and operated real estate company specializes in residential and commercial brokerage service, mortgages, closing and title insurance, land development, appraisal services, insurance services, corporate relocation and property management. With 205 offices across PA, OH, NY, VA, MI, WV, NC & MD, Howard Hanna’s more than 7,200 sales associates, management and staff are guided by a spirit of integrity in all aspects of the real estate process.